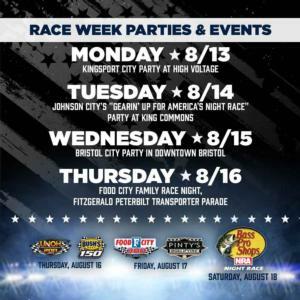 The cities of Kingsport, Johnson City and Bristol will all host downtown block parties to round out America's Night Race week. Kingsport will host their Race Week party featuring musical act Hundred Acres on Monday, Aug. 13 with Johnson City taking the baton on Tuesday, Aug. 14 with musical act Seth Thomas. Bristol will finish up the trio on Wednesday, Aug. 15 featuring Borderline, Wyldeheart and Shooter. For fans at the race track, shuttle service will be provided from BMS to/from the three parties. "We're blessed to have the support of the Chamber/CVB leadership teams who are creating these exciting community lead-up activities to America's Night Race," said Jerry Caldwell, executive vice president and general manager of Bristol Motor Speedway. "These Race Week events will get the party started and provide an opportunity for race fans and locals to have fun while supporting the businesses in our region." The three Race Week parties guarantee exciting action during every single day of the Bass Pro Shops NRA Night Race week. 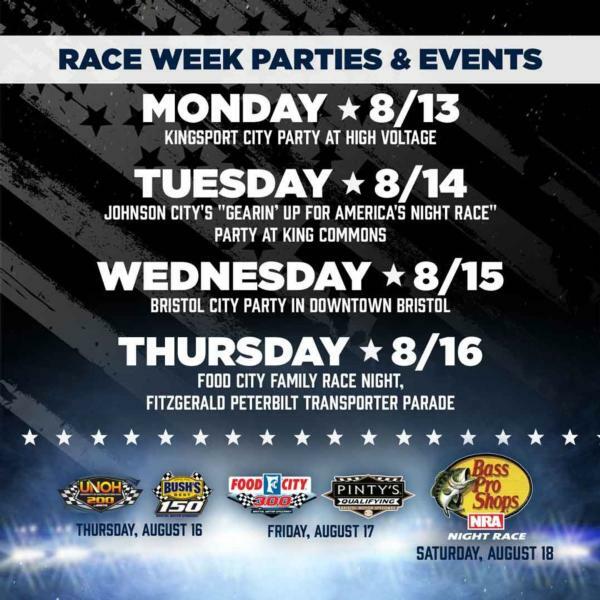 Following the three days of downtown partying, race fans will want to check out Food City Family Race Night on Thursday from Noon to 6 p.m. at BMS' Hospitality Village as well as the Fitzgerald Peterbilt Transporter Parade. That night, the future stars of NASCAR take to the track for the UNOH 200/Bush's Beans 150 doubleheader. The action continues Friday night with Pinty's Qualifying and the Food City 300. The party culminates with the party of the year, the 40th running under the lights of the Bass Pro Shops NRA Night Race on Saturday night. Bristol Motor Speedway officials are making it easier than ever for families to enjoy the weekend. Kids' tickets (12 and under) are free and adult tickets start at $30 for Thursday's (Aug. 16) UNOH 200 NASCAR Camping World Truck Series race and the Bush's Beans 150 NASCAR Whelen Modified Tour race. On Friday (Aug. 17), kids' tickets are free and adult tickets start at $30 for the Food City 300 NASCAR XFINITY Series race and Pinty's Qualifying. On Sunday (Aug. 18) adult tickets start at $70 for the Bass Pro Shops NRA Night Race and kids' tickets are $10. For all races, each child must have a physical ticket in hand to enter the gates. The Bristol Motor Speedway ticket office is the only authorized location that can produce the free kids' tickets. Tickets can also be purchased for a limited time directly from any neighborhood Food City store. To purchase tickets, please call 423-BRISTOL or buy them online at www.BRISTOLTIX.com.